Where Have My Yankees Gone? This past series against the Red Sox was incredibly embarrassing for my Yankees. God, it was unbearable! I thought I would finally be able to sit down and watch a good ballgame, because when they were out West I usually found myself waking up startled on the living room couch at 1am with the game over. Going back East, back HOME, seemed so comforting. For some odd reason, the Yankees have struggled so far in the Bronx this year, when previously, they had a great homefield advantage at Yankee Stadium. Their record is just 17-16 in New York – definitely not good enough. I don’t want to do recaps of these three games, because they were miserable. The Red Sox owned the Yankees, but I kind of feel like the Yankees beat themselves. This is not the team I saw in April, and there are many reasons why. First of all, injuries. Not to make excuses or anything, but the Yankees have been ravaged by the injury bug. Remember that seemingly-unfaltering bullpen they had in April? It’s all gone. Completely destroyed. Rafael Soriano (who was very disappointing anyway, but I didn’t think he would stay bad for long) is out for God knows how long with an inflamed ligament in his throwing elbow. So there goes the 8th inning. Joba Chamberlain was recently diagnosed with a torn ligament in his throwing elbow, and he may undergo Tommy John surgery. He’s pretty much out for at least the rest of this season. So there goes the 7th inning. Now the Yankees have names like Luis Ayala and Lance Pendleton, who looks a lot like Woody Harrelson, finishing up games for them. These are not the type of player who is going to win the team a championship. The Yankees need to so some serious work. 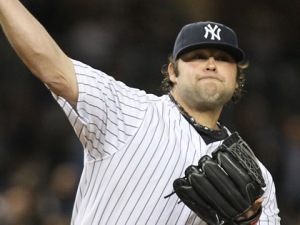 WHY ARE PHIL HUGHES AND JOBA CHAMBERLAIN SERIOUSLY INJURED? I don’t believe we will see either Phil Hughes OR Joba Chamberlain again this season, and I doubt if Joba has Tommy John surgery, that we will ever see him play in a Yankees uniform again. It seems like the Yankees are clueless when it comes to managing their players. These “Joba”-type rules are insanity. Coincidence that both these guys are damaged now? I don’t know. All I know is that, back in the day, when baseball players were MEN and not BABIES, they played the game. They didn’t have innings limits, pitch counts, or Joba Rules of any sort. And they had perfectly fine careers. I don’t get why they can’t just do that today. I mean what, this way is any better? It seems that players are way too fragile nowadays, hence these injuries. The Yankees are currently 33-27, but they really have not been playing well of late. They just don’t have that “spark” that they used to have. I don’t know why. Their team needs improvement drastically – in so many aspects. Relief pitching, for one. But also clutch hitting. I think the Yankees owe it to the fans to do something to get them a little excited, because maybe if the fans have a spark, it will translate into the team having some fire again. I say, since they need bullpen help and offensive help right away, just bring up some kids – and DON’T screw them up with “RULES.” Let them play the friggin’ game. 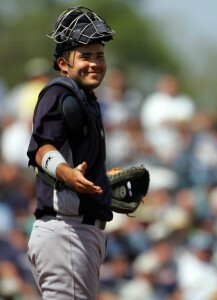 Russell Martin is a little hurt, Posada isn’t hitting well? Try bringing up Jesus Montero for a catcher/DH. 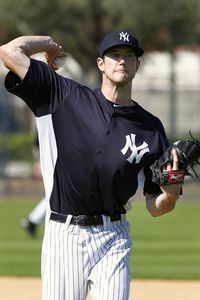 Maybe bring up Andrew Brackman (who is in Triple-A, just itching to get a taste of the Bigs) or Dellin Betances, and just try them out in the bullpen or in the rotation. Just DO it! Other teams do it all the time. Other teams actually USE their prospects! What a novel idea! It may sound crazy to some, but I swear by my idea. The kids are obviously good. They’ve been sitting there, wasting away in the Minors. They are good enough and experienced enough down there to come up. And since the Yankees are struggling mightily and don’t even look like the Yankees, maybe now is the right time to make a bold move like this. Maybe now’s the time to get a team together again. With the clocks now sprung forward, the calendar officially saying spring, and the snow gone, baseball really is right around the corner. The dawning of a new season is very close. Spring brings so many good things aside from baseball. I always look forward to the new spring styles in fashion. I’ve noticed several Yankees sporting some new styles this spring. Some I like, and some….ermm…not so much. Well, more slender than before. Coming off knee surgery, CC decided it would be beneficial to drop a few pounds before the season. He accomplished his goal and lost around 30 pounds. I think Sabathia looks fabulous. 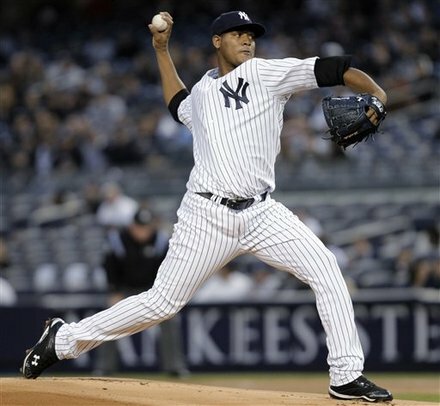 And not only does he look good – CC might even pitch better now that he won’t have that extra stress on his knees. I like this new CC, but I sort of miss the old one…I mean can I still call him nicknames? Like my Hefty-Lefty, or CC my Chocolate Chunk? His belly was cute, especially since he pitched so well with it. Look at him…trying to find his old belly and failing. But I guess I shouldn’t be too down. He’s smiling here – he has embraced his new slender(er) self. I can still call him cute names if I want. Mitre was having himself a pretty solid spring, but the Yankees traded him anyways, explaining that they felt they had a “surplus” of pitching (which I think you can never have). I loved Sergio Mitre and I feel bad for him. But what’s done is done. In the trade, the Yanks got Chris Dickerson, an outfielder. In his Yankees debut in the game today, he went 3-3. I wish him luck. And of course, Dickerson will look better in a Yankee uniform. Brian Cashman didn’t want to discuss Joba’s weight GAIN, so I’ll refrain from that. I will just note that I think his body looks good…he doesn’t look fatter, but rather he appears stronger. So that’s nice. But the hair…it sticks out of his cap. It’s long, curly, it’s…it’s almost resembles the Phil Hughes hair of a few years ago! Okay…I’m not too fond of this messy look, but it worked for Hughes. If it works for Joba, I might learn to really like this look. Yes, yes, YESSSS!!!! This is my FAVORITE new style of the spring, and I hope he continues to wear it into the season. God, he looks awesome. I wonder why he didn’t try this earlier. High socks make every player look better. It made A-Rod look better. It’s a little unflattering to say the least. Every time he’s at-bat, Alex stuffs handfuls of sunflower seeds into his mouth, and stores them in his cheek, chewing and spitting every few seconds. It looks ridiculous. I don’t know how he can possibly play like that without choking himself. Who am I kidding, right? Pshh…”how can he play like that…” A-Rod is having an AMAZING spring! He’s hit like 6 home runs, and the one I saw today went about 440 feet to dead centerfield. He’s a beast! Alex, if you wanna stuff your face, that’s fine. Just keep hitting! Overall, I think my Yankees look very very good…aesthetically, of course. But baseball-wise as well. I think it’s going to be a fun season. I can’t wait for it to begin!